New research published in the journal Pediatrics suggests that approximately 20% of new moms aren’t advised by their physicians on how to place their babies to sleep. The study was conducted by the National Institutes of Health (NIH), and was led by researchers from Boston Medical Center, Boston University, and Yale University. A national survey involving more than 1,000 mothers was arranged. Participants were asked about the childcare advice that they received from doctors, nurses, family, and news media. 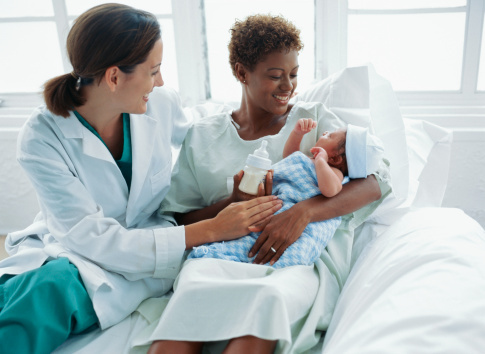 Researchers discovered that about 20% of mothers did not receive any advice from their doctors in regards to breastfeeding or how to properly place their babies to sleep. More than 50% of moms received no recommendations on where their babies should sleep. Researchers decided to explore the matter further, to see if the advice that was provided by health-care professionals was consistent with published recommendations. In regards to the sleeping position of a newborn, approximately 25% of advice provided was not consistent with recommendations for sleep location or position. Study authors conclude that health-care professionals need to be more specific when it comes to advising new moms about safe sleep recommendations. Lam, P., “20% of new mothers are not receiving advice on how to place their baby to sleep,” Medical News Today web site, July 27, 2015; http://www.medicalnewstoday.com/articles/297334.php.